Southampton professor Mark Spearing attended The Road Ahead Forum, which aimed to identify potential areas for collaboration between the UK and the Qatar Foundation. 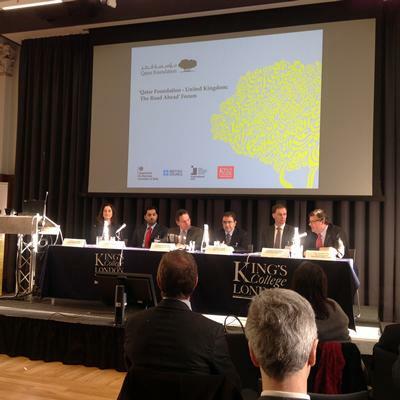 Due to Southampton's successes with bids for the Qatar National Research Funding and our strong relationship with the British Council, the International Unit at UUK and the Qatar Foundation, Professor Mark Spearing was invited to take part in a panel discussion for the Qatar Foundation UK – The Road Ahead Forum on 19 January 2015, KCL. Also attending the forum were Professor Sue Colley, Associate Dean Faculty of Health Sciences, Professor Mike Wald, ECS, Dr Andrew Warrs, Medicine and Dr Bashir Lalweed, Health Sciences and Karen Arnold, Regional Director for Africa and the Middle East. The mission for the forum was to identify potential opportunities for collaborations and partnerships with the UK. All three Research Institutes were represented by their directors – Qatar Environment and Energy Research Institute, Qatar Computing Research Institute and the Qatar Biomedical Research Institute.